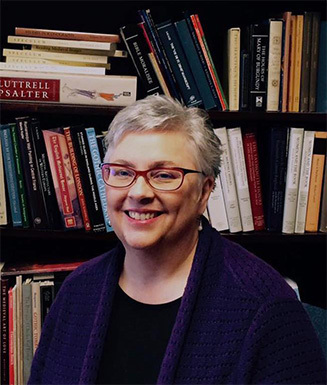 The Bonnie Wheeler Fellowship Fund is pleased to announce that Anne Rudloff Stanton is the recipient of the 2016 Bonnie Wheeler Fellowship, in the sum of $10,000, for her project Turning the Pages: the Power of Narrative in English Gothic Prayerbooks. Professor Stanton has been an Associate Professor in the Department of Art History and Archaeology at the University of Missouri since 2000. Her prize-winning book on the Queen Mary Psalter has established a firm basis for her subsequent research. She has published eight peer-reviewed articles and book chapters since its appearance, as well as several notable book reviews for major journals in her field. She has also shouldered a heavy service load in her department, including two terms as Chair of her department. The prayerbooks in the cluster that Prof. Stanton is investigating lie within the cultural orbit and patronage of Isabella of France, who was the daughter of Philip IV of France, the queen and widow of Edward II of England, and the mother of Edward III. Sources documenting her life include an inventory of the moveable properties she held at her death in 1358, which survives at the National Archives. Prof. Stanton has already written about the books in this inventory, and she now is studying the queen’s other belongings, including bedclothes and tapestries, robes and belts, and statues and paintings. Stanton as an art historian is primarily interested in the many image-bearing objects Isabella owned, but she is now also working with relevant historical documents and archives. Hers is a fully interdisciplinary project that will add substantially to our knowledge of this complex queen and the material culture of her time. A special feature of the Bonnie Wheeler Fellowships is the designation of a mentor who is responsible for reading the work-in-progress of the Fellow and for offering feedback, constructive criticism, and encouragement. Prof. Stanton’s mentor for this project is historian Linda Mitchell at the University of Missouri/Kansas City, the Martha Jane Phillips Starr/Missouri Distinguished Professor of Women's and Gender Studies; Professor of History; graduate faculty in History, Women's and Gender Studies, and Classics. Anne Rudloff Stanton’s story, like those of all our many applicants, reminds us how far there is to go before we achieve anything like equality for women academics.